Then you simply shape the bagels and let them rest for 10 minutes. To shape them you roll them into balls, poke a hole in the middle, and twirl them around your finger. Then you boil them in sugared water for just a minute. The dough doesn't separate or anything. I use a slotted spoon to get them out and set them on a towel to cool. Brushing the boiled bagels with egg white before baking gives them that nice sheen and enhances the chewy exterior. Yum! Final Analysis: Homemade bagels are surprisingly simple and very cost-effective to make. In my family's opinion, they far surpass grocery store brand bagels and taste more like real "New York style" bagels from a bagel shop. PS - Check out more Frugal Fridays here. 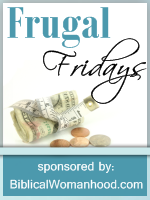 This is Crystal's last week hosting Frugal Fridays. Best of luck to her in her new adventures! My husband and I have been wanting to make bagels at home, your post has given us a little boost. I think we'll try later today or maybe tomorrow for breakfast. Thanks! That looks awesome! I love bagels, but on a diet I really have to limit them! Hi, I'm browsing around after finding you at WFMW. I would love to do this...How much sugar do you add to the boiling water? When you say "brush with egg white before baking", do you mean before toasting them, or do they need to be baked in the oven after boiling? If it's the latter, what's the time and temp? Thanks! Do you freeze them or eat them fresh? How long do they keep? Thanks for commenting. I love to hear your feedback! Have a frugal tip or thought? An idea for a post? A great deal to share? Email me at frugallyblonde@gmail.com. I'd love to hear from you! Your Ad here! Please contact me for rates. Why Spend Your Money on What Does Not Satisfy?